Municipalities use TIGG’s water treatment equipment all across the United States and Canada. Our experts work with consulting firms, engineers and local water authorities to design and manufacture integrated adsorption systems for the removal of drinking water contaminates such as disinfection byproducts (comply with EPA DBP Stage 2), metals, organics and solids through the use of granular activated carbon, sand, multi-media, and resins. The type of activated carbon used in your application determines the overall cost of operating and replenishing the media once it is spent. A recent study conducted by an independent environmental laboratory proves that TIGG’s 5DC 1230 activated carbon is effective at removing TTHMs from municipal drinking water. Scientific research has shown that granular activated carbon filtration systems are effective for removing PFOA and PFOS contaminants from municipal drinking water. These fluorinated, organic contaminants are two perfluorinated compounds, also known as PFCs or C8 compounds. PFOA and PFOS are considered emerging contaminants, and their negative impact on human health is becoming a concern of municipal drinking water providers. For more information visit our PFC page. 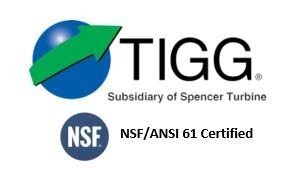 Engineering and consulting firms working on municipal drinking water purification projects can easily access proven system specification documents for inclusion in project bids from TIGG’s informative website. Our dual-vessel activated carbon systems are ideal for Pennsylvania municipalities looking to upgrade current capabilities to meet the challenges of complying with state and federal regulations. The back washable CP20K-10 and CP20K-12 systems hold 40,000 lbs. of activated carbon and have flow rates up to 1,500 gpm. These proven systems are currently used by municipalities in New York, Texas and other areas to provide their customers with purified potable water. At our 155,000 sq. ft. ASME code manufacturing plant, we fabricate filtration and adsorption tanks up to 14 ft. in diameter. TIGG builds various industrial water treatment equipment including multi-media filters, liquid phase activated carbon adsorbers, bag filter skids, hydropneumatic surge protection tanks and pipe racks. Three TIGG activated carbon dual-vessel skid systems went online in San Antonio, August 14. The systems are capable of purifying more than 5 million gallons of water a day. The integrated units were engineered at TIGG’s Oakdale, Pennsylvania, headquarters. The GAC adsorption systems are being used to proactively remove TOCs and THMs from Canyon Lake, a nearby potable surface water supply, to reduce potential for formation of disinfection by-products (DBP) in the distribution system, and ensure compliance with EPA Stage 2 DBP regulations. TIGG won the competitively bid contract to rent the systems to SAWS on July 3. TIGG’s CP 20K-10 dual Vessel Skid Systems meet or exceed SAWS specification requirements for the application. Read more Water Purification Equipment. A New Jersey water treatment plant needed to meet increasing demands on its services by initiating a new water filtration project. TIGG engineers looked at the municipality’s specifications and suggested improvements to extend the life of the filtration tanks, increasing the overall value of the project. TIGG engineers came up with an enhanced under-drain design and recommended lining the filtration tank with a more durable epoxy. The improved epoxy provides tighter cross-linking, thereby decreasing the permeability of the tank’s lining . The tank, which will remove iron from the community’s drinking water by using sand, anthracite, garnet and gravel as filtration media, is separated into three internal compartments by internal walls. The three compartments allow water flow to continue in two compartments, while the off-stream compartment is backwashing. The system lets the water treatment plant backwash one compartment using the water generated by the other two. TIGG delivered the custom-built, 10 foot diameter, three-compartment pressure filter in July and the municipality is currently constructing a new building around it. The water treatment facility’s schedule calls for the pressure filter to come on line later this year. During the Spring 2011 flooding in Tennessee there was concern that the drinking water plant would be flooded cutting off supply to the community, including the correctional facility. Evacuating residents is protocol in this situation, but what to do with the inmates? The prison has access to an irrigation well for water supply but the water does not meet drinking standards for iron and arsenic. The Tennessee Emergency Management Agency (TEMA) got involved to find a system to make the irrigation water meet drinking water standards. TIGG received a call at 2:00 in the afternoon to design and deliver a system to treat the water. TIGG assembled a custom system specifically for the irrigation water which included a clarifier with metering pumps for chemical addition, two sand filters, arsenic removal media vessel, backwash tank mixers and pumps. The system shipped by noon the next day and was assembled by their emergency contractor immediately. By the third day, the system was producing drinking water that met standards.